New from Intertronics comes the DYMAX Dual-Cure 9482, a UV light- and moisture-cure conformal coating specially formulated to flow underneath components on printed circuit boards and cure in these shadowed areas by using ambient moisture, which can result in faster throughput for through hole assemblies. 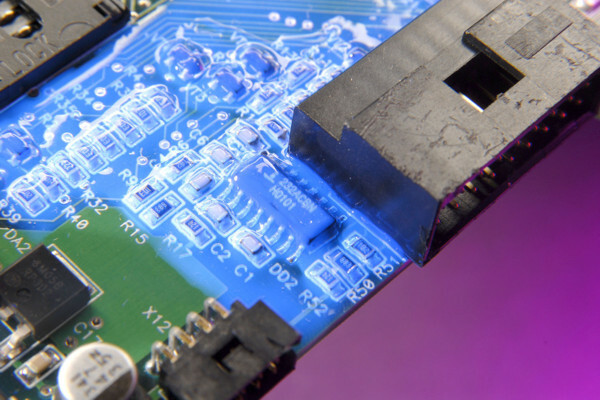 DYMAX 9482 coating demonstrates excellent re-workability which is of particular importance to manufacturers of expensive PCBs or manufacturers looking to increase board yields. Typical applications include electronic assemblies for the general and consumer electronics, automotive, appliance, and military equipment manufacturing industries. The 9482 coating features a vivid blue fluorescence when exposed to UV light which provides obvious detection of coating presence before and after cure – in addition it was developed to be tack free immediately after curing, helping to avoid defects such as fingerprints that may be left on the boards if they are handled too soon. Intertronics advise that DYMAX 9482 is engineered for superior circuit protection in applications requiring coating thicknesses up to 0.25 mm and confirm that the new 9482 coating enhances the Intertronics product offering of materials to meet the encapsulation, edge bonding, masking, and related needs of the printed circuit board and electronic assembly markets.